Sorry the link won't pate in the URL box. This is a heat pump dryer with an estimated 260KW Hr per annum A++ rating and a 5 year parts and labour warranty. Typically a condenser dryer uses 600 KW Hr. As heavy users we would at least double this usage paying back around £70 per annum in electricity. Considering a condensing drier with similar load and features cost around £300 it pays the difference in 2 years with 3 years warranty remaining. Update, not worth a new deal. these are now £25 off. The standard condensers are a around the 500-550kwh mark for current models. 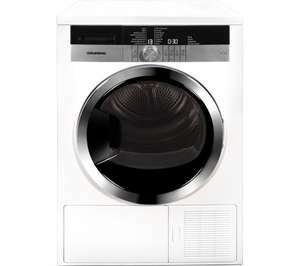 This is the same spec as the Beko DSK83410(around £350 when available) both are currys specials. IN terms of ratings there are not a lot(if any) that come close for these prices. The 8kg AEG posted a while back 308kw and 81% efficient condensing they came close.